Cadets A6-7, A6-8 & A6-10 in standard RAAF pre-war silver finish, rear cockpits fitted with folding covers for blind-flying training. In May 1935 the Avro 643 Cadet II was selected for RAAF training and an initial order for 12 machines placed with A.V.Roe & Company Ltd. Local production of the chosen training aircraft was being considered and the Cadet was considered favourable to the DH.82 Tiger Moth because its performance was better with the the air cooled radial engine. In addition deHavilland had specified a slower delivery rate at higher cost, and stipulated that 36 DH.82s must be built in England before Australian production would be allowed. The first six Cadets arrived at Melbourne on board SS Nestor on 29 December 1935. Two months later an agreement was approved between the Australian Government and A.V.Roe & Co Ltd for manufacturing rights for Australian built Cadets. A further order for 10 British built Cadets was approved on 18 August 1936, followed by another 12 Cadets placed on 18 August 1936. Delays in establishing the Australian production necessitated another order for 12 more British Cadets approved on 18 November 1937. In a complex story of RAAF policy changes and Australian politics of the volatile years leading up to the outbreak of World War Two, the planned Australian production line was never established. There is evidence that British factory jigs and forgings were brought to Melbourne in the preparations. While Australian production was still being debated, on 20 August 1938 the RAAF placed an order for a further 12 Cadets with A.V.Roe. However wartime production in Great Britain overtook export orders resulting in that final order not being delivered. The British civil training company Air Service Training Ltd at Hamble offered its fleet of second-hand same model Avro Cadet Mk.IIs to the Australian Government, but the offer was declined. Total deliveries to RAAF were 34 Cadets, all the Avro 643 Mark II model, powered by the 150hp Armstrong Siddeley Genet Major 1A radial engine, operated without cowlings. The RAAF named them Avro Trainers and they were referred to by that name during their RAAF careers. In June 1938 a RAAF specification was issued to replace biplane trainers with low wing monoplanes for primary training to be powered by the DH Gipsy Major engine. In general terms this resulted in orders for 200 Australian built CAC CA-6 Wackett Trainers, and 50 Australian assembled DH.94 Moth Minors. Then in 1940 DH.82 Tiger Moths were made available to Australia by the British Government to become the standard basic trainer for the Empire Air Training Scheme and the DH.82 went into large scale production at Mascot by deHavilland Aircraft Pty Ltd for the EATS in Australia, Rhodesia and South Africa. The RAAF's Avro Cadets continued in advanced training roles during WW2, mainly with Central Flying School at Camden NSW which specialised in training flying instructors. During the war the RAAF obtained Genet Major engines from the Canadian Government where they had been replaced in Canadian built Fleet Finches with Kinner radials. In addition RAAF reverse-engineered Genet engine spares which were manufactured locally, including pistons, piston rings, valves, valve guides and seats. Such an effort indicates that the remaining Cadets were considered essential to the wartime training effort. Crash repairs and scheduled maintenance was contracted to civil operators such as Newcastle Aero Club and Marshall Airways at Mascot. 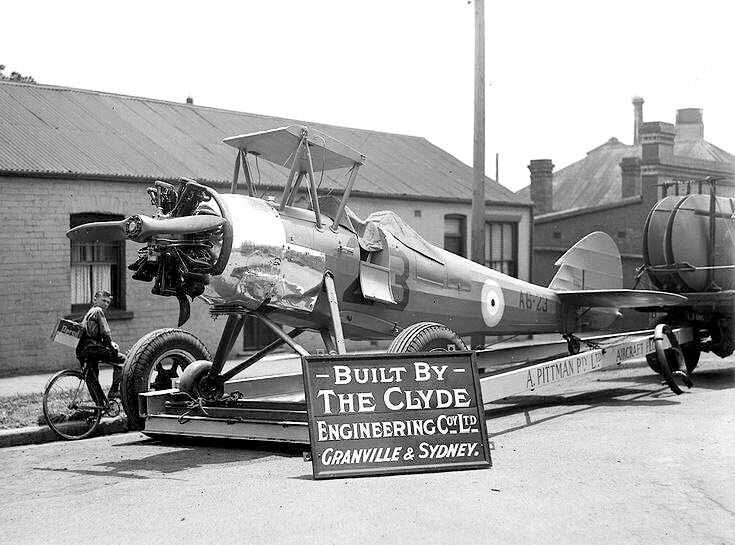 However the majority of RAAF Avro Cadet repair and overhaul work was carried out by Clyde Engineering Co Ltd at their Lidcombe factory in Sydney. A local transport company moved the completed Avros between the factory and RAAF Bankstown where assembled for test flights, using a truck loaded with the wings, towing a specially-built trailer for the fuselage. As the War drew to a close, the surviving Avro Trainers, along with other types regarded as obsolete, were withdrawn from service and stored pending disposal. Cadets formed part of a large group of surplus aircraft which were disposed of during early 1945 before the end of the war. On 20 September 1944, the newly formed Commonwealth Disposals Commission wrote to the Department of Air asking which types and quantities of aircraft likely to be released in the post-war period. This enquiry elicited a reply on 28 October 1944, in which details of the first aircraft and engines to be released were given. 17 Avro Trainers with 25 spare Genet Mk.IA engines were listed for disposal , and appeared on the first tender issued by the C.D.C., which closed on 20 February 1945. All Avro Trainers had been retired during 1944 and flown to RAAF Narromine for storage, before being ferried to RAAF Narrandera NSW. Over several days at the end of December 1944/January 1945 large numbers of RAAF CAC Wackett Trainers were also ferried from Narromine to Narrandera at that time. This mass movement of retired training aircraft was probably to clear parking areas at Narromine for RAF and Royal Navy aircraft being assembled at Bankstown and Schofields for the planned British force to advance on the Japanese homeland. DCA approved the Avro Cadets for civil use and 17 received civil certification, initially flown by aero clubs and private owners. Later Cadets found a new role in aerial agriculture, when a number were fitted for dusting and spraying and two were re-engined with the more powerful American 220hp Jacobs R-755 radial. A modification installed on most drop dusting Cadets was an air scoop on the top of the rear fuselage, to expel superphosphate and other granular fertiliser dust, which otherwise covered the fuselage internal structure. A proposal was submitted to DCA in a letter from Proctors Rural Services, Alexandra Victoria in June 1958 to re-engine agricultural Cadets with a 165hp Continental 0-470-K horizontally opposed six cylinder engine driving a McCauley constant speed propeller. The significant increase in power and changed engine installation weight would involve a changed Centre of Gravity datum and revised fuel system. The plan progressed to the trial installation of a flat six engine in a Cadet (probably VH-BJB but unconfirmed) while dismantled for overhaul in the Brookes Aviation hangar at Moorabbin during 1960. However when the overhaul was completed the Cadet retained the original Genet engine. The final phase of the Australian Avro Cadet story is the re-emergence of long retired Cadets folowing lengthy restorations as immaculate flying examples, some in RAAF colour schemes. Several more are yet to reappear. 11.11.36 Tipped on nose Point Cook while taxying in strong wind, pilot Cadet E.H.Ross. 1.4.46 DCA memo: Newcastle Aero Club have been advised that approval has been given for A6-2 and -28 to be ferried Essendon-Newcastle for civil overhaul by Club. Registrations VH-APV & -APW have been allotted. Both were purchased from J. H. Alessio and stored dismantled. Both will be assembled and certified for the ferry flight by Mr. F. H. Edwards at Essendon. Believed to be the damage fuselage frame included in NAC Cadet spares collection acquired by Proctors Rural Services. It was donated to a Victorian fire brigade for fire practice, and the burnt frame was acquired by Howard Jones, Morwell Vic from the back yard of a house near Warburton Vic. 24.4.36 Minor damage at Point Cook in forced landing due engine failure, pilot Cadet Wight. 2.5.38 Struck fence landing Point Cook: on approach to the landing field, AC.1 Curtis applied side-slip and in an endeavour to recover, aircraft stalled and the wheels touched a fence - on bouncing, the underside of the fuselage struck a post: damage to a cross-member in fuselage, undercarriage and floor. A6-10 (Cadet Weston) taxying across his bow - both pilots endeavoured to avoid collision, but were unsuccessful: damage to A6-3 was considerable, and included the fuselage, the port lower and both starboard mainplanes, the airscrew, undercarriage, centre-section, engine. 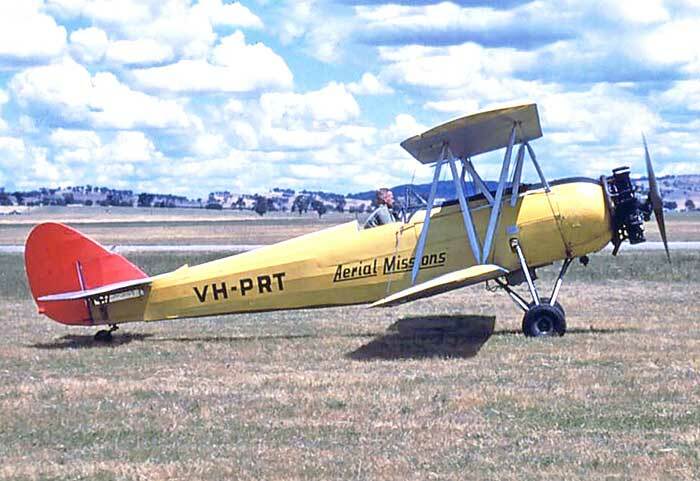 26.3.45 DCA memo: Newcastle Aero Club have purchased Avros A6-5, -18, -25, -8 which have been allocated registrations VH-AEG/H/I/J. An additional purchase is A6-33 for which they have requested marking VH-AAR but it is not available. Two Avros remain to be ferried from Narrandera to Newcastle. 11.11.51 Spun into ground, destroyed 12 miles NE of Kempsey NSW while practising aerobatics, both on board killed. 11.11.51 Newspaper reports state the aircraft had done two loops at low altitude then spun into the ground on a farm at Clubucca, 10 miles from Kempsey. Pilot Nerio Parissotto, (aged 22), passenger Lucaano Favotto (also aged 22) both killed on impact. The pilot was son of Kempsey Italian airman Mr. S. Parissotto. Aircraft owned by Newcastle Aero Club, one of several from the Club which give training at Lismore every weekend. 23.9.36 Overturned on landing in strong crosswind Point Cook, Cadet Leighton. .91 Sold by Jones as a partially restored project to Darryl K. Hill, Hong Kong. Darryl Hill quotes his purchase date as 10.10.92. 03 Restoration of AEJ's fuselage at Murwillumbah well under way by Nick & Greg Challinor of Mothcair Aviation Services for owner Darryl Hill. Wing spars ordered from Croydon Aircraft Co in NZ and when they are delivered work will commenced on the wings and tail group. The AS Genet radial was rebuilt by Borg Sorenson's Aircraft Engine Works, Victoria. 8.2.07 First flight Murwillumbah after 14 year restoration, pilot Matt Handley. Aircraft all silver, painted as RAAF "A6-8". Darryl Hill flew the aircraft later that day. 9.12.36 Collided with Moth, crashed Point Cook. While on a test flight by Flt. Lt. C.D.Candy, while approaching to land, collided with Moth A7-31 being flown by Sgt. Somerville, wreck of A7-31 struck A7-36, which was parked on the tarmac and caused some damage; Somerville died as a result of injuries received, Candy received some facial injuries. 6.45 Sold to Clarence H. McBean, 27 Chesnut Street, Richmond, Melbourne. 20.6.45 Letter to DCA from Alessio advising that he has sold A6-10 to Clarence H. Bean. 2.12.49 Crashed destroyed Melton Vic. Struck power lines, crashed on road and burnt out, pilot C. H. McBean and passenger both killed. Press report said they had been visiting friends at Melton and soon after takeoff to return to Melbourne the aircraft struck high tension cables, plunged to the ground and burst into flames. Cal McBean (aged 40) of Richmond and Edward Sweeney (43) also of Richmond were burnt to death. 5.5.38 Overturned on landing at Point Cook: owing to a stopped airscrew, pilot AC.1 Curtis attempted to land - as aircraft neared the ground it turned right and landed cross-wind, ran some distance, bounced and overturned: damage to port upper and both starboard mainplanes, fin & rudder, engine mounting stays, engine, tyres perforated with thorns. 19.8.49 Change of ownership: Mrs. Dorothy I. Leckie, Binginwarri via Yarram, VIC. History of Latrobe Valley Aero Club, Morwell Vic: "The LVAC founders arranged for Yarram Aero Club instructor Doug Leckie to bring his Avro Cadet to Morwell to provide flying instruction on weekends." 7.6.45 Registered VH-AFX James M. Bindt, Yarram VIC. Identity quoted as "4632"
.10 Overhaul at Latrobe Valley and repaint into Hardy Brothers agricultural scheme, fleet number "2"
Morwell Vic in April 2010, rolled-out after a major overhaul and repaint in the scheme of Hardy Bros Spraying Co in Queensland. 5.5.38 Damaged Point Cook: engine stalled and pilot AC.1 Sage made a forced-landing in forced-landing paddock : a cadet went to assist to start the engine, it started but owing to the fact that there was no one in the cockpit, the tail rose and the airscrew hit the ground, breaking the airscrew. Laverton local flight, pilot S/Ldr F.Wight, carrying photographer John T. Harrison to take air-to-air photographs of RAAF Magister A15-1. 19.5.38 Damaged Point Cook: while in charge of Cpl. Watson owing to faulty manipulation of switches and incorrect airscrew swinging drill, the engine started and propeller struck an airman, resulting in a broken propeller. 6.7.67 noted Bankstown in Marshall Airways hangar, hung from roof. Complete, silver with red trim. c75 Transferred to Jack Davidson, Bankstown, later The Oaks airfield, near Camden NSW: stored. Davidson was Marshall Airways Chief Engineer for many years and inherited most of Sid Marshall's aircraft when Sid died. 3.80 Unairworthy aircraft in Davidson's Bankstown hangar were moved by road to The Oaks aerodrome in a truck by Doug Jeffery who owned DH.82 VH-PCG based at The Oaks. Eight loads in all, one aircraft per trip: included Avro Cadet VH-AGH, Westland Widgeon VH-UGI, DH.60M VH-UQV, Comper Swift VH-UVC. c2.96 Purchased from Davidson by Clinton D. Ashton-Martin, Wedderburn NSW. 25.4.08 visited Temora NSW fly-in: RAAF camouflage scheme as "A6-17"
20.3.10 visited airshow Melton Vic "A6-17"
VH-AGH attended an airshow at Temora NSW on 25 April 2008, the day after its first flight following a 15 year restoration project. 7.3.38 Taken on RAAF charge as A6-18. Received 23 Squadron. 6.4.60 crashed after takeoff, ag strip Mansfield VIC. Became airborne too early from a sub-standard strip, sank back to the ground, undercarriage collapsed, aircraft overturned. 21.8.61 crashed destroyed by fire, Cobden VIC. While crop-spraying, aircraft crashed and was destroyed by fire, pilot J. Talar escaped with minor injuries. VH-AEH in 1956 after modification to a single seat crop sprayer with Proctor’s Rural Services, Alexandra, Victoria. Apostrophe pedants will note the painter’s misuse in the company’s name. The Collection p6525-0810. 3.38 Taken on RAAF charge as A6-19. Received 23 Squadron. 27.7.43 Forced landing, extensive damage. 3.38 Taken on RAAF charge as A6-20. Received 23 Squadron. 3.38 Taken on RAAF charge as A6-21. Received 23 Squadron. 5.10.56 Crashed during forced landing Mataranka NT. While being ferried Adelaide-Darwin for new owner Moffatt, engine failure caused a forced landing on unsuitable terrain near Mataranka near Darwin, pilot Charles Miller unhurt. 3.38 Taken on RAAF charge as A6-22. Received 23 Squadron. 18.1.40 Damaged at Point Cook: an airman accidently knocked the throttle open on Wapiti A5-33 and jumped out, whereupon the Wapiti crashed into a Bellman hangar and caused varying degrees of damage to four Cadets (A6-13, A6-22, A6-28 and A6-31) : A6-22 received slight damage to rudder. 20.2.45 Included in Commonwealth Disposals Commission's first disposal list: located at RAAF Narrandera. 27.3.45 Sqn Ldr F.W. Robilliard wrote to DCA: "I have recently purchased Avro Trainers A6-23 & -34. I am engaged as CFI 2AOS and will personally ferry one aircraft, the other will be flown by Flt Lt Gibbons." Identity quoted to DCA as 1058. Surviving Log book confirms ex A6-23. 25.10.50 crashed “Bungaree” Station, Clare SA. This wartime picture shows A6-23 after overhaul by Clyde Engineering Co in Sydney, being transported from their suburban works. VH-AHH crashed on "Bungaree" Station, Clare SA on 25 October 1950 while cropdusting. Photo: R. Brennan via Nigel Daw. .61 After engine had been overhaulled, it was installed in the fuselage while wings and some of tail structure were removed. Wheels did not have brakes fitted, so were chocked to prevent the fuselage rolling forward. While the engineer had left the aircraft with engine running outside the hangar, vibration moved the left wheel clear of the chock, causing the fuselage to swing to the right, pulling the right wheel free of its chock. The engine and prop then pulled the wingless fuselage between two buildings until it struck a wall heavily. Propeller was destroyed, engine and fuselage structure damaged. The aircraft was repaired by Maf-Air. The damaged tubular metal fuselage frame required considerable welding repair. 8.1.64 noted Ballarat in Mafair hangar, agricultural equipment removed and two open cockpits. Hangar has been taken over from Aerial Missions by Missionary Aviation Fellowship - Mafair. Purchased of PRU from Barry Cosson included a large quantity of spares which Aerial Missions had stored in a hangar at Ballarat. 26.3.67 damaged in forced landing on Albury airfield due engine failure after takeoff. Pilot Joe Drage attempted to land on a road but continued back to the aerodrome when he saw cars on the road, while still in the turn the port wing struck the ground just inside the aerodrome boundary. Came to rest on belly with undercarriage collapsed, pilot unhurt. DCA accident report indicates power loss due fuel starvation. 73 3 damaged Avro Cadet airframes stored in hangar St George. Identities not confirmed. .74 Howard Jones recalls that when he collected the St George airframes, VH-PRU was fairly complete standing on its undercarriaged in the right hand back corner of Cliff Parson's hangar; another straight complete fuselage frame was hung on the back wall, and on right side of the hangar was a third badly damaged airframe. The only frame with an identity tag was VH-PRU (a small stainless steel tag screwed to the cockpit woodwork). 4.74 Arrived by road at Warrigul Vic. 4 year restoration to airworthy by Nick and Greg Challinor of Mothcair Aviation Services at Murwillumbah NSW, assisted by their father Peter Challinor. The Genet Major engine came from Jack Davidson, The Oaks NSW, originally from Marshall Airways. The engine logs showed it was originally with Air Service Training Ltd at Hamble. The AS Genet radial was rebuilt by Borg Sorenson's Aircraft Engine Works, Victoria. 20.8.93 noted at Murwillumbah, approaching completion, assembled and painted silver as RAAF "A6-25"
19.8.94 delivered from Murwillumbah to Nowra NSW by Steve Merritt. Silver RAAF scheme "A6-25"
22.4.95 visited Cowra NSW fly-in, owned Steve Merritt, "A6-25"
98 displayed at Weeks' museum attraction Fantasy of Flight, Polk City Florida. Newcastle Aero Club Avro Cadet VH-AEI and Tiger Moth VH-AOD at Casino NSW 1948 while on loan to the Casino Aero Club. 94 Howard Jones has VH-AEL, AHW & APW at Morwell: he plans to complete one, leave one as a long-term project and possibly offering the third for sale as a restoration project. Has three fuselages under restoration side by side in his workshop at Clarkes Road, south of Morwell. 30.1.40 Forced landing Point Cook, no damage: while being flown by P/O Ramsden (passenger P/O Hemsworth), a probable temporary airlock in the fuel system caused by aerobatics stopped the engine - the pilot successfully force-landed the aircraft without damage. 3.6.40 U/S major repair at CFS wind storm? 14.4.45 ferried from RAAF Narrandera to Essendon. 31.10.48 struck fence during forced landing Mugu NSW near Mudgee. Pilot Kelvin Eades and is passenger, both from Newcastle, escaped unhurt. 17.3.50 Engine log book for Genet Major No.9975 fitted to Cadet VH-APW: first entry. Regular daily flying hours recorded until last entry 3.8.50 "aircraft damaged". Pencilled note states 3558 hours total. Acquired by Cliff H. Parsons, St George Qld: stored dism. 80s Tygalgah airstrip was closed. Vic Mason moved his Cadet VH-AFY and retired Callair A9A VH-MPR to a warehouse in the Queensland Gold Coast area. 20.4.46 Change of ownership: John A. Gillies, Melbourne VIC. 8.10.60 noted at Moorabbin in Brookes Aviation hangar, dismantled on overhaul. A Lycoming flat six engine was installed. However when the overhaul was completed, it had been fitted with a standard Genet radial engine. 24.11.60 flew agricultural demonstration at Aerial Agricultural Operators Association Symposium at Wagga NSW. 22.3.61 damaged aircraft arrived on truck at Moorabbin for rebuild. Indications are that the damage was caused by wind while aircraft on the ground. 12.66 ferried from Hobart to Albury by Joe Drage, 8.5 hours. Joe Drage flew to Hobart in a Victa Airtourer VH-MRI with Barry Wilson, arrived Cambridge 17.12.66 to collect the Cadet then they flew home in formation. 85/02 Static display at Drage Airworld, Wangaratta Vic, later renamed Airworld, Wangaratta Vic. 28.9.95 VH-PRT reserved by City of Wangatta Vic. Reservation renewed 16.10.98. .03 Airworld closed to the public early 2003 due financial losses. 26.3.45 Newcastle Aero Club wrote to DCA requesting registration VH-AAR for this Cadet. It was previously allotted to a DH.82 impressed by RAAF from the Club. The initials are for the Club President Mr. A. A. Rankin. DCA replied refusing the request, stating that the policy was not to re-allocate registrations. 19.4.51 Newspaper reports stated the Cadet was landing in foggy conditions and struck the truck on Inverell aerodrome. The aircraft and truck were extensively damaged. The pilot and passenger were unhurt, and the truck driver escaped with a scratch on his hand. Acquired damaged by Cliff H. Parson, St George QLD: stored dism. A6-34 c/n 1069 (VH-AHI), VH-BJB, (VH-AVR), VH-RUO. "A6-34"
31.3.45 ferried to Parafield via Kerang, Nhill by Frank Robilliard. At Parafield parked in his brother Pat Robilliard's hangar. Pat founded Robbys Aircraft Repair Co at Parafield. 4.4.45 Sqn Ldr F.W.Robilliard wrote to DCA: he had arrived at Narrandera on 29.3.45 to collect his Avro aircraft but petrol ration book had not arrived from DCA as previously arranged. His leave from RAAF was limited so he departed at 0700 on 30.3.45 but was forced back due to a dust storm. Departed Narrandera again next morning 31.3.45 and flew via Kerang and Nhill to avoid the dust. 10.4.45 Owner writes to DCA advising that A6-34 is to be dismantled for the present. 4.45 DCA allocated registration VH-AHI. DCA file quotes identities Avro Number R3/LT/3454 & A6-34. 6.51 noted at Broadmeadow, all silver, NAC emblem, fitted with two cockpit enclosed canopy, adapted from a CAC CA-6 Wackett Trainer canopy. 4.2.61 Crashed Launching Place Vic. Collided with tree and nose dived into the ground during a forced landing due loss of engine power because of an ignition fault: pilot’s vision impaired by fertilizer dust. 14.11.61 Testflown Moorabbin after rebuild at Moorabbin by Airspread Australia, pilot C. Rasmussen of Airspread Australia. 63 BJB wreck stored in a hut at Ballarat aerodrome, along with a collection of Avro Cadet parts. The Aerial Missions hangar at Ballarat was now taken over by Missionary Aviation Fellowship as their maintenance and pilot training base, also carrying out general maintenance. Avro Cadet VH-PRU was in this hangar awaiting sale. Compiler’s note: the ground engine running accident at Ballarat which is assumed to be VH-PRU in 1961 could have been VH-BJB after crash rebuild at Ballarat c1962. Howard Jones recalls seeing BJB before Ken Orrman commenced his rebuild: badly damaged condition, partly burned, "some sort of ground running accident I believe". by 74 BJB acquired by Ken Orrman, Shepparton VIC: moved from hut at Ballarat for rebuild project. 5.10.79 K.E. Orrman wrote to DoT requesting allocation of VH-AVR or VH-AVO for an Avro Cadet rebuild. He states it is probably formerly a Proctors Rural Services aircraft because the airframe had been stored in their premises at Ballarat aerodrome. It had been written off due to a taxying accident and resultant fire at Ballarat in early 1960s. 27.10.91 Ken Orrman wrote to CAA requesting renewal of his earlier reservation of VH-AVR for his Cadet. He was advised that VH-AVR had now been allocated to an Avid Flyer 8. DH.60 VH-SSC, DH.82A VH-DYI, DH.83 VH-UVL, DH.87 VH-UVV, DH.89 VH-IAN, PA-22 Tripacer VH-SDJ. 27.7.00 Ken's DH.83 VH-UVL & DH.60 VH-SSC were also first registered 27.7.00 after lengthy storage at Shepparton in complete airworthy condition. 19.6.03 Delivered to RAAF Point Cook from Tyabb by Hosking, Last flight. 03 Static display at RAAF Museum, Point Cook, painted as pre-war silver RAAF "A6-34"
The crash scene at Launching Place Vic, 4 February 1961. Victorian Aerial Farming Aids name on the fuselage. (nr Tamworth) Landed on unsuitable terrain during an agricultural flight. Superphosphate in hopper became damp and stayed in the hopper. When more super was loaded for the next flight, the aircraft attempted a takeoff while overloaded.